Hughes and Salvidge were honoured to welcome Colonel Steve Lawton and Army Basing Programme Director Mark Duddy to our site at Bulford Camp this month – and both gentlemen appeared to have a ‘smashing’ time too. 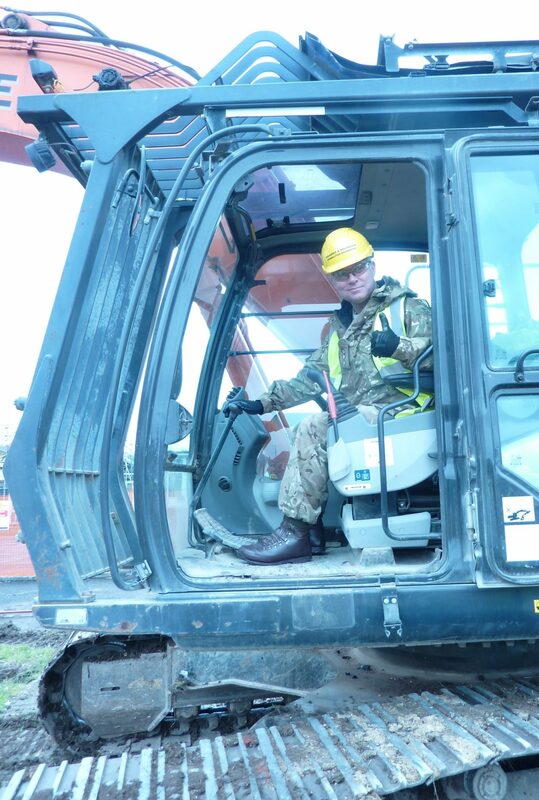 Colonel Lawton, Garrison Commander for Bulford as well as Tidworth and Netheravon Camps, was the first to jump in the cab of one of our 250 machines. Under the expert tutelage of our own driver, Paul Berry, Colonel Lawton started work on demolishing one of the former accommodation houses on the Camp, and promptly went on to demolish over half the building! Colonel Lawton said afterwards the power of demolishing a building had fulfilled a childhood dream, and he stepped aside to allow Mr Duddy to finish off the demolition of the property. Hughes and Salvidge have been appointed by Aspire Defence to complete the demolition and site clearance of this latest development within the Bulford Camp. The latest in a long list of MOD projects we have completed.